Dome-field advantage? Maybe not. When the Bucs faced the New Orleans Saints in Sunday night's critical NFC South matchup, the Louisiana Superdome setting seemed part-hostile, part- friendly. Thousands of Tampa Bay fans made the trip, displaying red-and-pewter garb in the French Quarter on Saturday night, then supporting their team, mostly from the nosebleed sections of the third deck or the end zone. 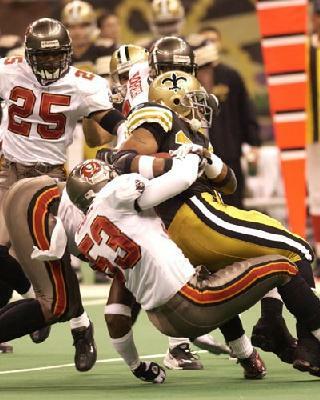 All around the Superdome, there were Bucs fans holding red placards: ``Big Easy Win!'' There were Chucky dolls, Sapp and Lynch jerseys, makeshift pirate outfits and Buccaneer banners.